Chrissy McKaigue says Slaughtneil hurlers have to produce "the game of our lives" to make history in Sunday's Ulster club final against Cushendall. The club is bidding to become the first Derry team to win the title when they play the Antrim champions in Armagh. Slaughtneil are chasing a unique Ulster football, hurling and camogie treble. They reached the All-Ireland club SFC final in March but lost an Ulster hurling semi-final to Cushendall last year after a replay. "There's a lot on the line for this (Ulster hurling final)," stated McKaigue. "No Derry club has ever won it and it's going to take the game of our lives to do it, but we are capable. "The last few years we were in bonus territory somewhat, but I think now there is a bit of belief that we can actually go and do it. The team has matured a wee bit. "Ourselves and Cushendall are no strangers to each other so there won't be too many secrets." 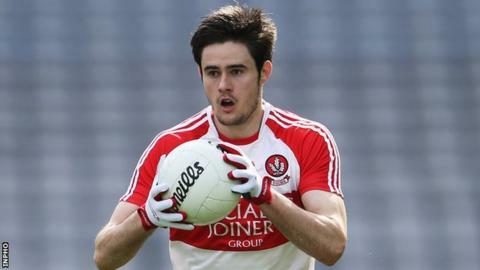 McKaigue revealed he declined an invitation from Ireland International Rules manager Joe Kernan to attend trials this year due to a hectic club schedule. The 26-year-old has been an Irish regular since returning from a two-year stint with AFL side Sydney Swans in 2011. "Joe has been more than accommodating, but I just literally can't get a free weekend. "Me and Brendan (Rodgers) were asked down to it and we're both in the same boat. "The Ulster hurling final on Sunday will be our 13th championship game in 11 weeks between hurling and football, so there are more matches than weeks. "I just had to put all my energies into this and at the minute, that's more than enough." Slaughtneil lost to Loughgiel in the 2013 Ulster SHC final and succumbed to Cushendall last year in the semi-finals after a replay. They defeated Down champions Ballycran in the club hurling semi-final a fortnight ago, before an opening defence of their Ulster club SFC title ended in a comfortable preliminary round win over Fermanagh champions Derrygonnelly last Sunday. McKaigue said: "it's not ideal, you'd prefer a two-week slot to prepare for any championship game but we have to embrace it". "It's about patching people up and getting them ready for the next week". Cushendall fought back from nine points down at half-time to beat Ballycastle 2-16 to 1-15 in the Antrim final. Shane McNaughton, Neil McManus and Arron Graffin are all fit again for Cushendall but it is still likely to be a tough challenge for the Antrim champions. Cushendall needed a replay to account for Slaughtneil in last year's provincial semi-final and with a sticky pitch highly likely on Sunday, the Derry club's greater physicality could give then the edge.